To verify an adequate reef deployment location for the upcoming CCA/BCT funded reef creation project, a dive team identified and surveyed an area of seafloor within the boundaries of the Floyds Folly area (Permitted Area SAJ-2007-261) on 6-10-2018. The Floyds Folly area may also be referred to as “FF” in the remainder of this document. 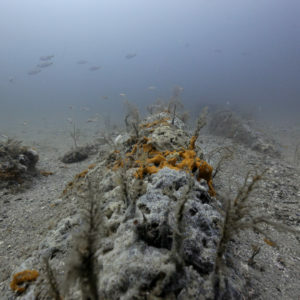 Results of the survey efforts suggest the area is adequate to place the anticipated concrete artificial reef materials. Divers that participated in dive survey and data collection efforts included Joe Kistel, Ed Kalakauskis, Jack Leone, and Ryan Glisson. Operations support included Jeanine Leone, Elizabeth Glisson, and Larry Davis. A location within the FF permitted area was to be identified and surveyed to determine its adequacy to accept concrete artificial reef material. The site selected and surveyed is referenced in the graphic below. 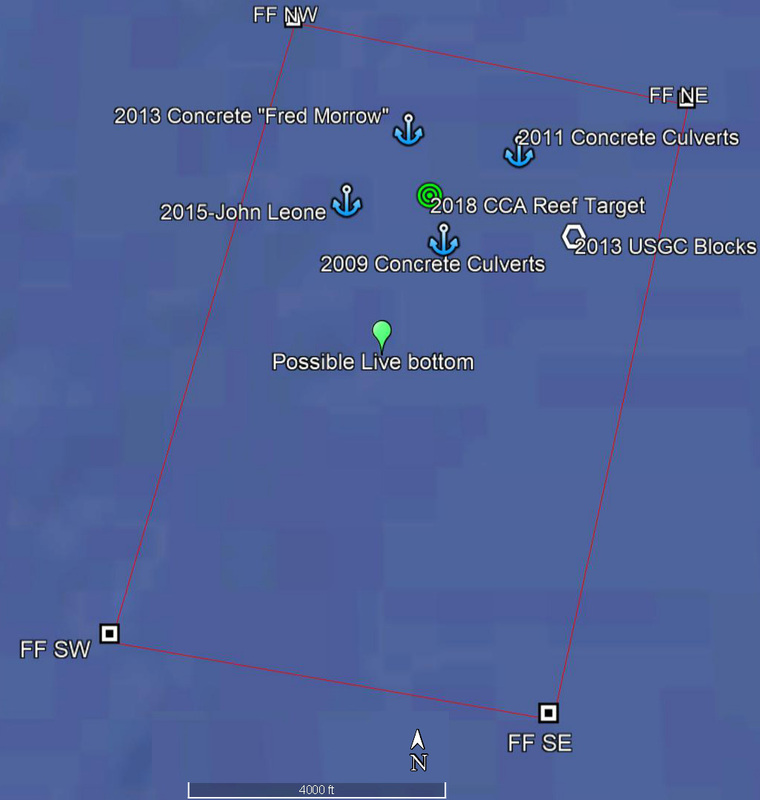 The area surveyed (noted by the green target in the above graphic) is strategically located in the center of 4 previously deployed artificial reefs, approximately a quarter mile from each reef in the permitted zone. Prior to initiating the dive survey, east-west transects were conducted in a northerly direction using the diving vessel to investigate the area at large with an onboard Garmin depth finder. The sonar equipment displayed a depth on average of 70 feet and a seafloor flat and free of obvious live bottom. Appearing to be an adequate location from the sonar instrumentation observations, the anchor of the vessel was dropped at 30° 10.205’ 81° 09.358. The anchor location served as the center point of our survey efforts. This resulting center point location is roughly .5 miles from the nearest permit line boundary and .2 miles from the nearest known existing reef. 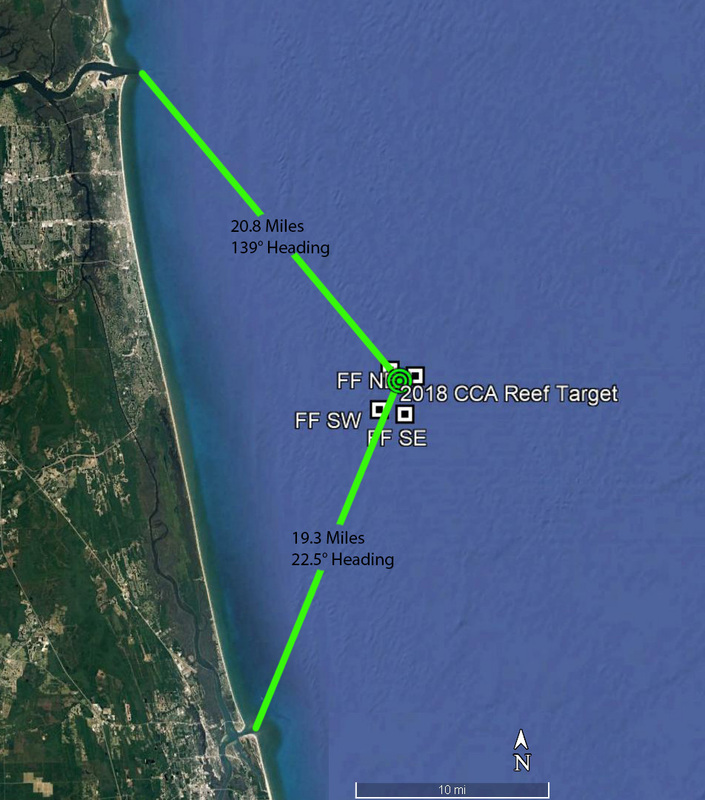 The image below identifies the selected site in reference to the Mayport Jetties and St. Augustine Inlet. The site is just over 20 miles at a south easterly heading from the mouth of the Jacksonville Jetties and just under 20 miles at a north easterly heading from the mouth of the St. Augustine Inlet. Once the site referenced above was identified, divers entered the water for further site analysis. Divers performed a 300-foot diameter circular sweep, observed marine life, photographed/filmed the area, and probed the sea floor. During the dive efforts a thermocline was observed at 45 feet and the temperature on the sea floor was about 76°F. 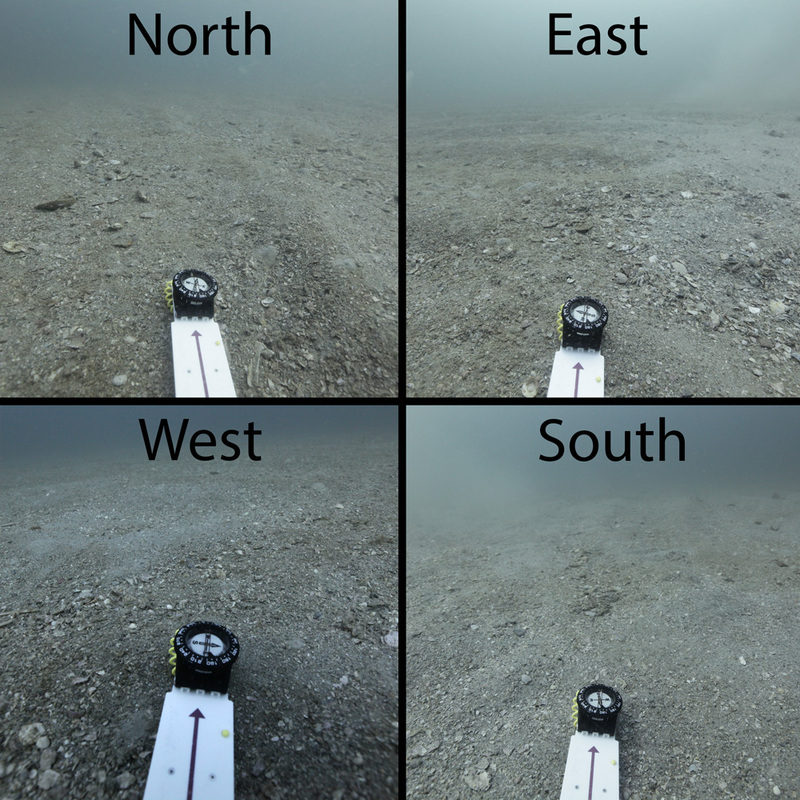 Visibility at the sea floor was estimated to be 20 feet and no significant current was noticed. Then dive team attached the free end of a measuring reel to the anchor on the seafloor. The anchor served as the benchmark and center point of the area surveyed. The dive team then traveled at a heading of 0° from the anchor until they reached the 150 foot mark. They made a mark in the sand here to use as a visual reference to know when they have completed a full circle sweep. From that point the team turned towards the east, and with their reel line taught, began to swim easterly. The dive team swam a giant circle swimming until they returned back to their north starting point (where they made their mark in the sand). The diameter of the sweep completed was 300 feet. The divers reel was never snagged throughout the entire swim. This indicated that no obvious signs of live bottom as the reel line would have snagged any protrusions sticking out of the sea floor. - No obvious live bottom such as natural reefs, sponge beds, and/or gorgonian forest were encountered within the 300-foot diameter area swept. - The bottom appeared primarily flat with a stiff sandy bottom substrate. 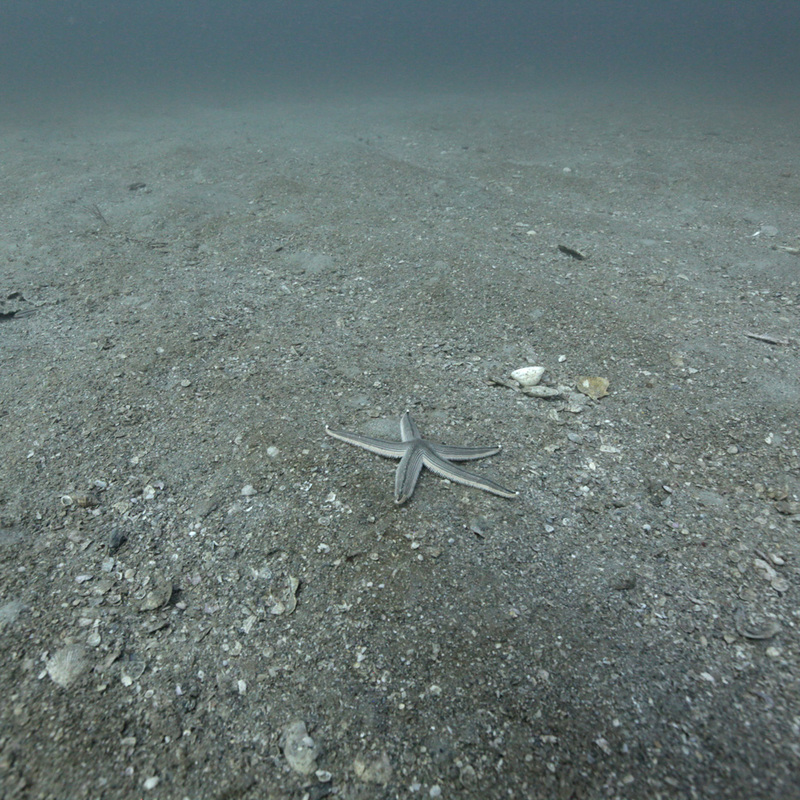 Very little ripples in the sand substrate were observed in some areas. 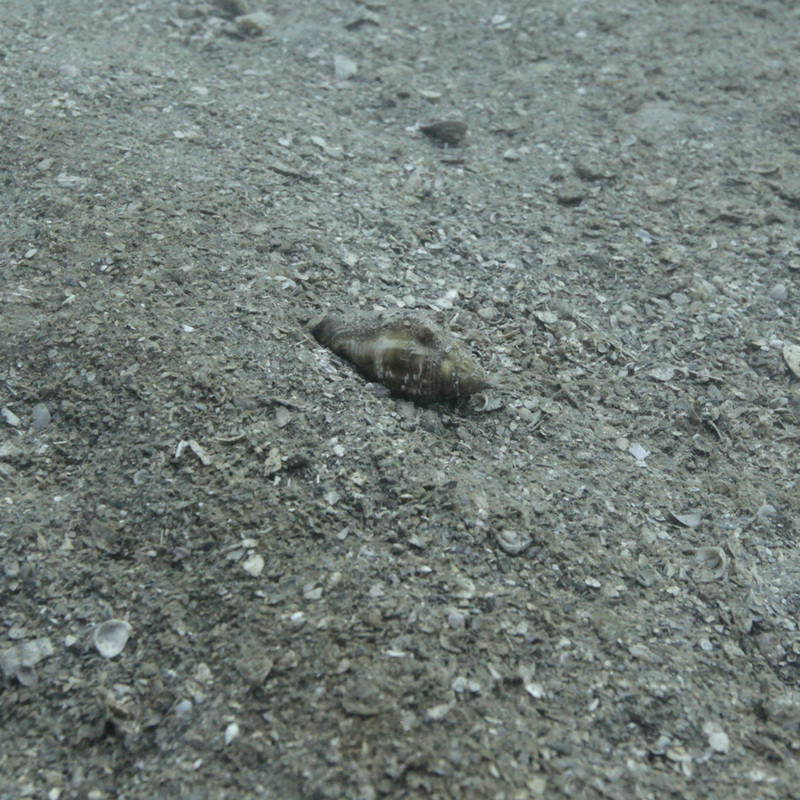 - The bottom substrate was primarily sand with some larger aggregate including shell pieces. - Invertebrate life observed included sea stars, hermit crabs and jelly fish. - The few fish observed included and juvenile wrasse and seabass. A steel ½ inch diameter pipe was used to randomly probe the sea floor throughout the area surveyed. The sea floor firmness, noted by the depth the probe penetrated the substrate, perhaps provides some indication of future reef materials ability of not sinking into the sea bed. 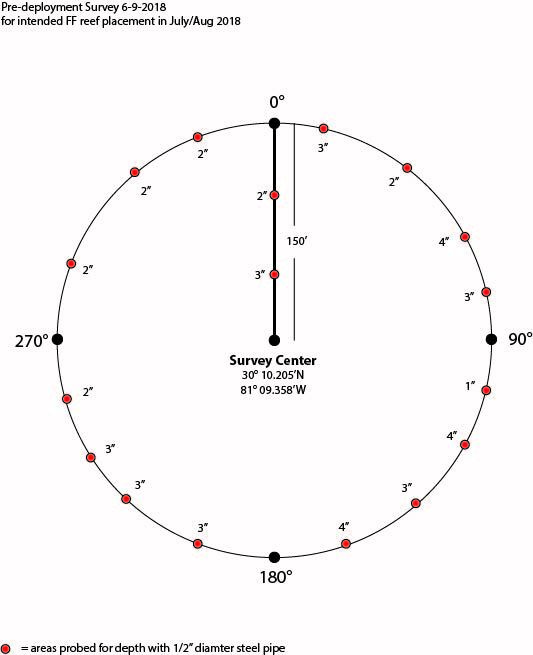 The diagram below shows the depths of probe penetration at various locations of the surveyed area. On average, the probe penetrated roughly 2 inches deep indicating a stable substrate. Divers also visited the nearby artificial reef that was deployed in 2015. The existing reef, known as the John C. Leone Reef (JCL), is approximately .23 miles away (in an east heading) from the surveyed area discussed in this report. Since the reef to be deployed will consist of similar material as the existing reef, observations at the JCL reef could provide some indication of how the new CCA reef may evolve. - Some of the fish encountered included Tomtates, Flounder, Snapper, Gag Grouper, and Black Sea Bass. Based on the results of the survey efforts, the area located at 30° 10.205’ N, 81° 09.358’ appears adequate for the future deployment of concrete artificial reef materials. -The recommended site is within FF permitted area (Permit # SAJ-2007-261). -No obvious signs of “live bottom” were discovered within the area surveyed and 200 feet outside the surveyed area boundaries. -Sediment penetration suggests a relatively firm substrate base. 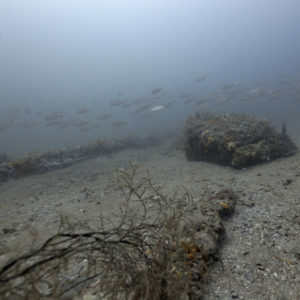 -The average depth of the site appeared to be around 70 feet based on scuba divers’ instrumentation. This depth allows for over 20 feet of relief of reef materials to stay within the permit requirements of 50 foot sea surface clearance.